One Mom's Moxie: ClosetMaid Activity Table Giveaway! 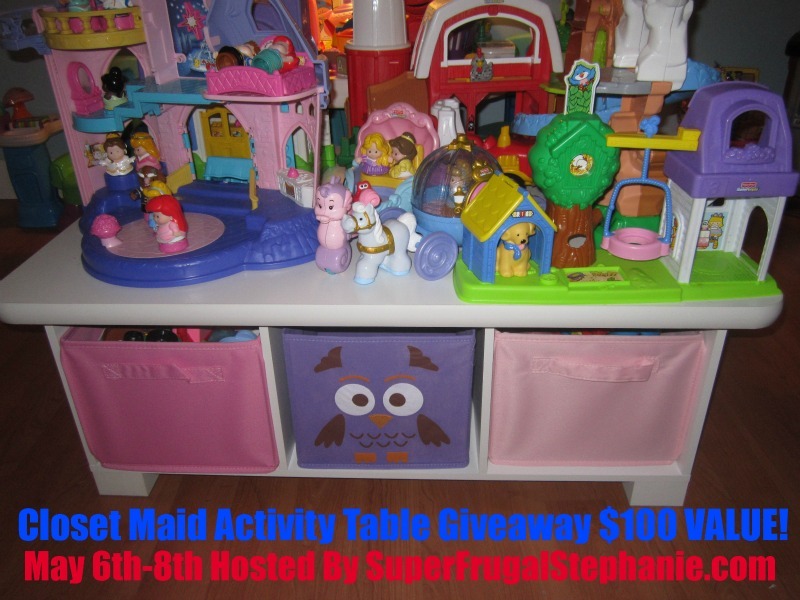 SuperFrugalStephanie.com has teamed up with ClosetMaid to bring you an Activity Table Giveaway! Valued at $100! Please check out Super Frugal Stephanie's Review of the ClosetMaid Activity Table! This ClosetMaid® Organizer is a sturdy, low-sitting play table that is comfortable for kids. Designed to work perfectly with ClosetMaid Cubeicals® Fabric Drawers sold separately. One Lucky Reader will get the opportunity to win the ClosetMaid Activity Table! It is a great addition to any home and will definitely make any space organized! I would love to have one of the Cubeicals to organize my craft supplies! Love the 3 cube bench! Thanks! I like the closet organizers. I like the wire shelves.